Periodontal grafting (or gum grafting) involves removing a small piece of gum tissue from the palate of the mouth and attaching it to the gumline where the gums are receding. In most cases, provided there is sufficient bloodflow, the tissue will graft to the new site – covering exposed roots and improving the aesthetics of your smile. The procedure may sound scary, but the purpose of this blog is to reassure you that gum grafting is a relatively minor surgical treatment that has a high success rate and leads to improved oral health. Which patients would benefit from a gum graft? Patients whose gums have receded so that in places a tooth root is exposed, but who still have some interdental tissue, are most likely to benefit from a gum graft. Periodontal disease is the most common cause of gum recession. A gum graft will cover the exposed tooth root protecting the tooth from decay and reducing sensitivity to hot and cold foods. What preparations should I undertake before my grafting surgery? Continue your normal oral hygiene routine in the weeks before your procedure. If an exposed root is making your teeth sensitive, use a special toothpaste such as Sensodyne. Our patients have reported this toothpaste as very effective at reducing sensitivity. During the procedure itself your mouth will be numbed by a local anaesthetic, so you will feel no pain. There may be some discomfort and slight swelling in the days following the procedure. This should be relieved by a mild analgesic such as paracetamol. What is the success rate of gum graft procedures? The success of the procedure depends on sufficient bloodflow getting to the new tissue. We will carefully assess the state of your gums and we won’t recommend this procedure unless we think it has a strong likelihood of working. The other thing that can prevent a graft from being successful is if the site of the graft is disturbed in the days following the procedure. Our specialists will advise you on aftercare of the treated area – ensuring tissue is not agitated until it has bedded in. Our hygienists can help you develop a hygiene routine that will keep your teeth clean during this time. We recommend a diet of very soft food – soups and smoothies – for a short period after the surgery. What is the patient experience of gum grafts? 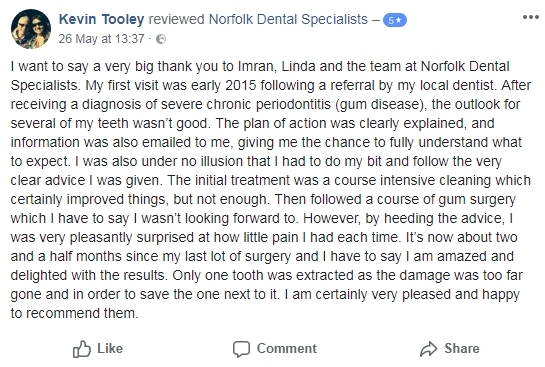 What other gum treatments do you offer at Norfolk Dental Specialists? 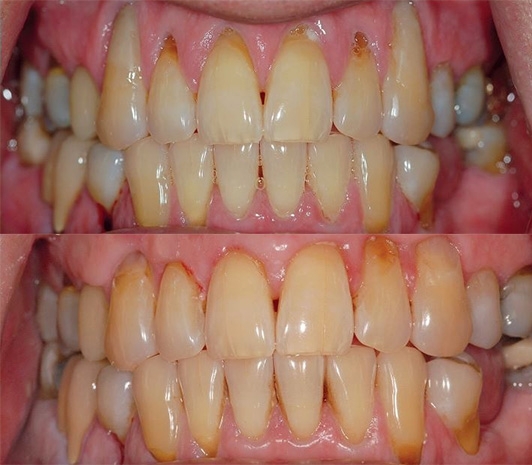 Whether you have a gum graft to improve function or aesthetics, patients often receive the benefits of both: a beautiful new smile and improved periodontal health – your keys to smiling, eating and speaking with comfort and confidence. Our dentists are specialists in periodontal treatment. That’s why other dentists refer their patients to our practice for advanced treatments. If you have any questions about any of our procedures, please don’t hesitate to get in touch. Call our reception on 01603 632525. Follow us on Facebook and Twitter for more of our patient stories.